Verizon is to introduce a new range of Home Media Servers to work with its set-top boxes. The new Verizon Media Servers will be more energy efficient and will only need a scale down version Verizon set-top box in each room connected to your television. 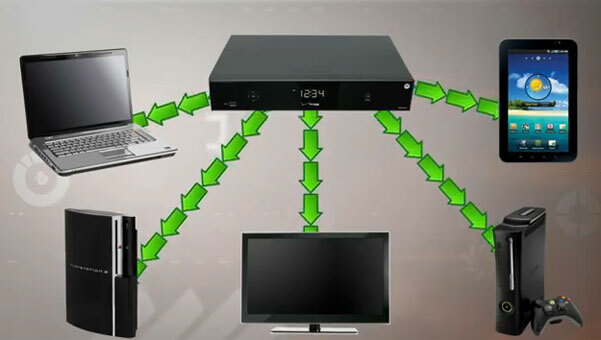 Developed in partnership with Motorola; Verizon said they will only need to deploy a smaller set-top box to each room, one that is small enough to connected to the back of your television. The new Verizon Home Media Server will be capable of streaming to your television, game console, mobile devices such as tablets and smartphones in HD quality. They did not say when in 2012 they will launch the new Home Media server or any details about pricing. In a video Tushar Saxena, Director of Technology at Verizon show samples of the Motorola branded boxes. Over the years Verizon has been working to deploy more environmentally friendly set-top boxes and between 2011 and now they have managed to issue only energy efficient set-top boxes. According to Saxena the Home Media Server and the smaller more energy effiencient set-top boxes are only a stepping stone to the ultimate wireless media streaming solution. Saxena said, in a few years Verizon use the Home Media Server to deliver content wirlessly to the different appliances – ultimately taking your entertainment energy use down even lower. In another video they demonstrated transmitting a 3D HD FiOS signals over Wi-Fi upto 200 feet with out a drop in quality of the steram.